That headline sums up what I felt when I spotted this orchid in a south Florida box store (rhymes with Gnome Repo). I know that an eventual move to Fort Lauderdale would require some adjustments and adaptations and learning, but nothing quite prepared me for orchid fever. From their smiling faces to their vibrant colors, from their graceful bounce to the way their blooms line up along the stem — I find myself completely entranced. My lack of knowledge has done nothing to stop me from envisioning how I would like to display my orchids, which, by the way, have not even been purchased. I envision a metal rack attached to the side of the house, with loops to hold terracotta pots, each one containing an orchid plant. And then, there would be the ground orchids (pictured below), which are planted in soil, throughout the various beds. While I may not know a lot, I do know when I’m being duped — like with this blue orchid found not only in Gnome Repo, but also in the one that rhymes with Blows. I admit the fancy face caught my eye, but it was all cosmetics — or “garden magic,” as the small writing on the tag claimed. The truth is that once the blue blooms have faded, all future orchids are white. Part of me is a little angry at the scheme to get buyers’ money — but I’m also a little puzzled. Isn’t an orchid beautiful enough in its own natural state? 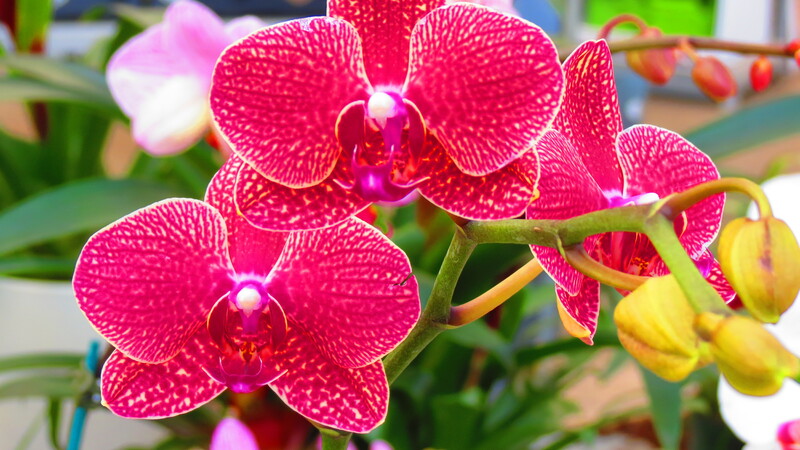 Do we really want our orchids to be nothing more than so many celebrities and “real” housewives — all implanted and botoxed and lifted? And that brings me back to my wants. When it comes to orchids — both big and small — I’ll take mine raw and real and “Oh” so natural. I was about to post my orchid flowers in full bloom too! I always thought they were for the rich, posh people who lived in big houses with huge conservatories…those with ‘the’ knowledge, greener than green fingers and bags of cash. How wrong I was, mere mortals such as ‘I’ can grow them…I have 4 sitting on the kitchen window-cill. When I remember, I water them, when the flowers fade, I snip them back, occasionally I dust thir leaves and that’s about it. Zero knowledge required, no fancy houses or glass-rooms. I am rewarded year in, year out with magnificent blooms, certainly not requiring a drop of faux colouring…sheesh! Jane, thanks for the advice — I may nag you again in the near future when I create my orchid wall. Kevin, you’re right to be puzzled by the artificiality of unnatural orchids – and, you’re in for serious seduction when you buy just a few of the natural ones. Trust me, I know how slippery the orchid slope can be, and I don’t even live in Florida, as you plan to. 🙂 Each time I enter a nursery, I ogle these plants like they’re in a window in some red light district. Pretty intoxicating. Oh orchid fever is bad! Their beauty is addicting. I started with one and now have 10:) Due to the weather where I live all my orchids are grown indoors under lights. Water once a week,fertalize once a month. I have 2 in spike right now. The most difficult part is waiting for the blooms. But they are so worth the wait! I am so looking forward to this addiction. Maybe we can start a support group. We just might need one! Thanks for your kind words. I teeter on the edge of daylily addiction. Quite a potent attraction! You’re quite welcome. Daylilies have no mercy once you’re addicted … LOL. I live within 30 minutes of a fabulous daylily farm, so there’s no hope for me. I’ll have lots of new daylily photos soon – http://www.daylilysoup.com. Hope you’ll stop by to to see the new photos. I will definitely stop by for a fix. Joining the chorus: Orchid fever is a delightful malady! I love the comment above: Beware. Enjoy. “premature floralization” 🙂 But if you don’t try to grow these beauties you never will learn how, and besides I want to read about them ! My P.F. is not something I take lightly. 🙂 And many thanks for the encouragement. I wondered when I saw those blue blooms. I’ve never seen anything like it. Of course it can’t be real. I agree, orchids are so amazing on their own, Why would anyone need to colour them up to make them more sellable? It’s one of those great marketing mysteries. Either you have it, or you don’t — and orchids definitely have it. I always associate orchids with Florida. I saw the most fascinating collection at the home of artist Jonathan Green. My friends down on Sanibel Island tied orchids to the trunks of palm trees. The plants were about 7-9 feet off the ground, maybe higher, and growing nicely. It was a very naturalized and tropical effect to have that burst of color cascading off the tree. When the orchids had attached themselves to the trunk, they removed the strings. How annoying to find such beautiful blooms and then discover that the colour is artificial. Still there are lots of lovely orchids in real colours, and they are lovely plants to collect if you have the right climate for them. It makes no sense why they would mess with something so beautiful. 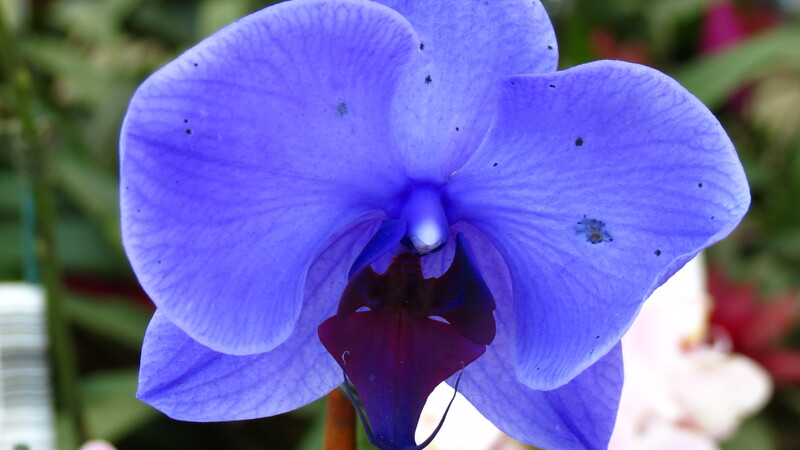 I feel badly for the consumers who lost their money on a blue orchid. Imagine, after 57 years, I too have just discovered the pleasures of the big “O”. Mom actually bought one for a friend who has been out of the country for a couple of months and I happily agreed to orchid sit until she comes home. It’s mine now. I love everything about that plant and have realized how easy they are to care for. My next one will be a large, pure white one. That’s a long time to wait for the big “O”. And to think that you had to resort to theft! The daylily farm mentioned in a previous comment is in Alabama. I would have orchid fever, too! Those little ground orchids are adorable, and the others are just stunning. I think you’ll be spending a lot of money to get satisfied! I’m still chuckling about “premature floralization.” I think I experienced the problem quite a lot when I was younger. I can never understand why anybody wants to mess with beautiful flowers by dying them some weird color. They’ve always intimated me in my zone 7 world. I always felt I didn’t have enough of something that they required. Glad to learn that they’re pretty easy. 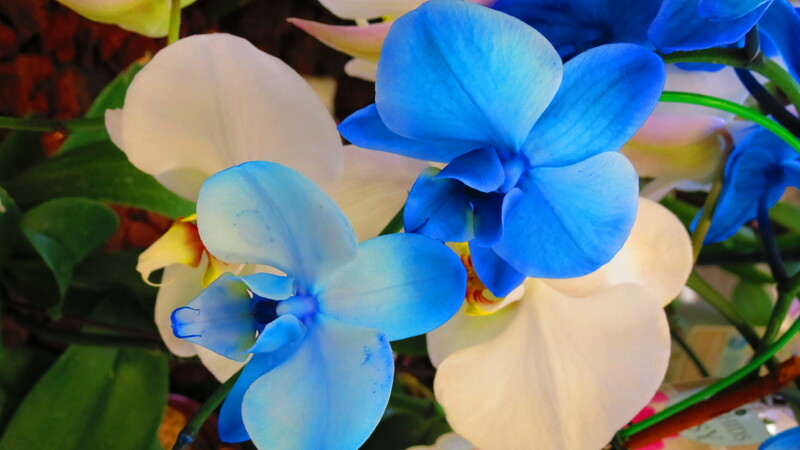 I was so excited about those blue orchids until you outed them as fakes! Ugh! How disappointing. By the way, that headline made me laugh out loud. Love it! 0! Haha, great headline…and liked that bit about Star Wars….. 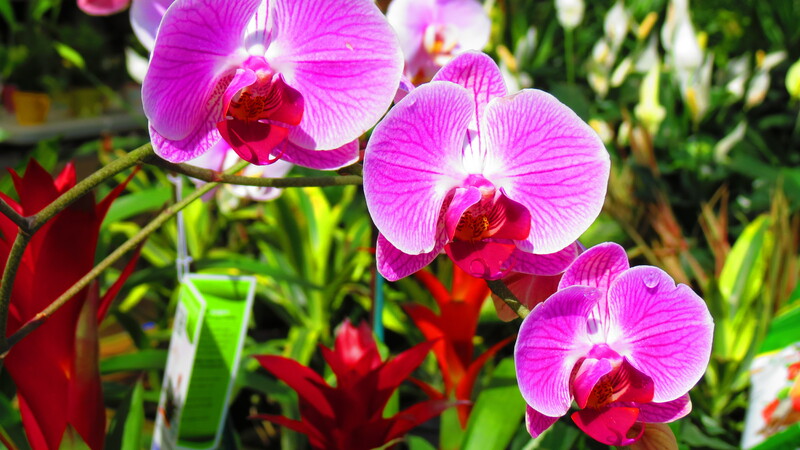 Yes orchids are very easy to grow. Some liquid Fertiliser occasionally, plus I like to give them some worm tea castings every so often. And really easy to divide altho they don care all about being in a too small pot. Have you read “The Orchid THief?’ great book about passion for orchids. I’ve never read the book — but it’s now on my list. Thanks for the tips, reading and growing. Love it Kevin! I once saw an Orchid in the wild along Mississippi river. Thought I was going to die! That had to have been one of those magical moments, when you have to rub your eyes and blink a few times. Kevin, you come by your Orchid Obsession quite naturally! Don’t know if you’re aware of it, but they were your grandmother’s favorite flower. If she could have grown them, she would have! So, my dear boy, they are in your blood!! I was absolutely blown away by the first photo of the bright blue one, and love the hot pink ones that are almost butterfly shaped! Beautiful photos! Please keep on sharing your passion with us all! I had no idea! Now, I will definitely have to have an orchid wall! Kevin – I think you’ll have a lot of fun learning a whole new zone to garden in! The orchids were lovely. I’ve always been envious of the people who can grow them successfully. Best of luck with orchids and the move to FLA! Astrid, thanks for the encourgement. I think the blue ones look very odd and unnecessary when there are so many beautiful orchids from plain white through to all the ones with delicate markings. 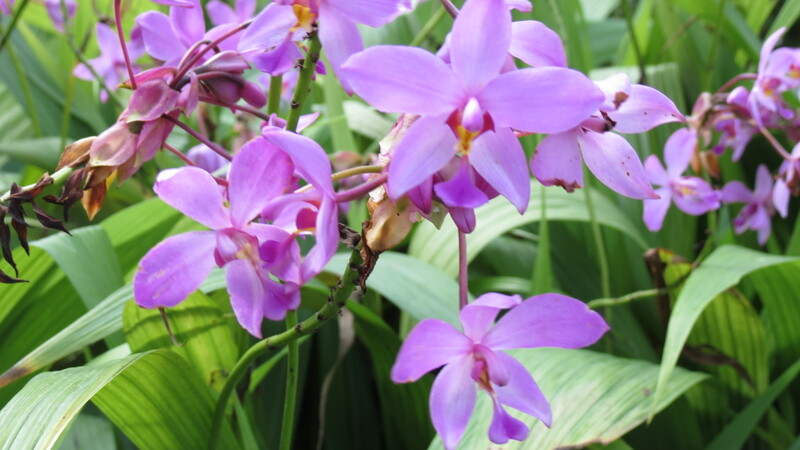 Folk that know will always have you believe that orchids are easy to grow…. Janet, I agree. The blue is almost too blue. It looks artificial — and orchids do not need any help. As an avid Spartacus fan, all I can say is that I’m laughing my gluteus maximus off (lmgmo).